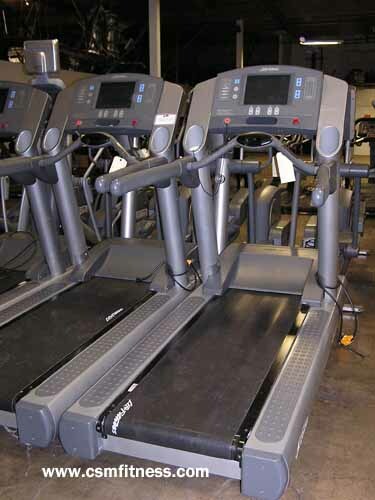 The Life Fitness 95Te treadmill is very similar to the Life Fitness 95Ti, but it has an added feature, which makes it a more desirable unit. Particular to the 95Te is the E3 Integrated LCD System with a built in TV. This display system has touch screen technology, a ready FM radio, and a maximum of 125 TV channels. These luxuries allow the user, whether it be for home or gym use, to experience a tranquil and mind distracting workout, while still experiencing the vigorous and effective workout particular to Life Fitness products. Workout Programs: Classic—Manual, Quickstart; Zone Training+ Heart Rate Workouts—Heart Rate Hill, Interval, Extreme Heart Rate, Cardio, Fat Burn; Interval Workouts—Random, Hill, 5k, 10k, Speed Interval Training; Goal Workouts—Calories, Distance, Time in Zone; Custom Workouts—6 Customizable Workouts; Fitness Test Protocols—Gerkin Protocol, Navy, PRT, ARMY PFT, Marine PFT, Air Force PRT, Physical Efficiency Battery (PEB), Customized Cool Down. Display Readout: Elapsed Time, Speed, Distance, Incline, Calories, Calories per Hour, Heart Rate, Distance Climbed, Watts, METs, Custom Messaging, Profile Window, Time in Zone, Language Choices.